Writing a LinkedIn summary is incredibly difficult — for everyone, but especially for salespeople. You’re not targeting recruiters and hiring managers; you’re appealing to buyers. That means on top of finding an interesting and genuine way to describe your professional background, you must also come across as a subject matter expert.If you need some inspiration, good news. These seven LinkedIn summary examples will help you find the right words. 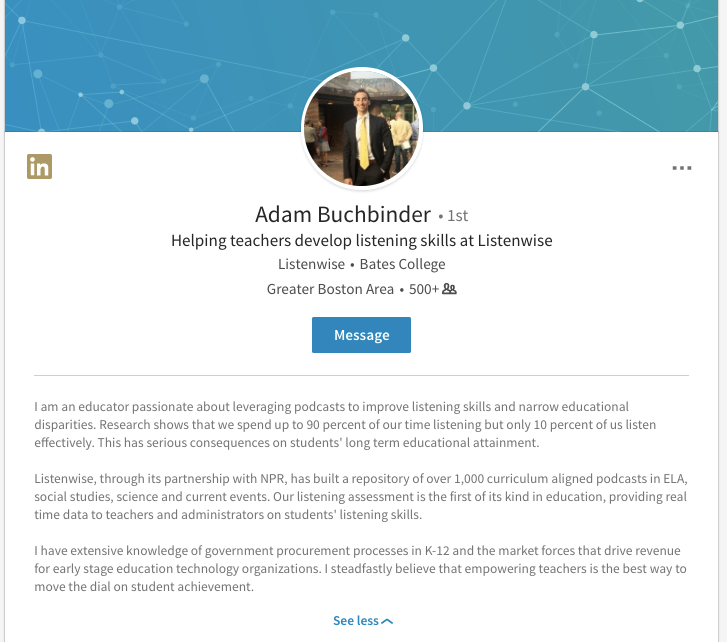 Adam Buchbinder, a salesperson at Listenwise, draws potential customers in by describing his enthusiasm for “improving listening skills and narrowing educational disparities” — two goals they probably care highly about, too. His next line tells prospects he’s interested in learning their needs, not just selling them. Then Buchbinder establishes his expertise. Try it yourself: Describe the most rewarding aspect of your job, whether that’s helping small businesses go mobile or making corporations more efficient. Next, highlight why you’re qualified. How many people or companies have you worked with? What are their average results? Which high-level problems are you well-equipped to solve? 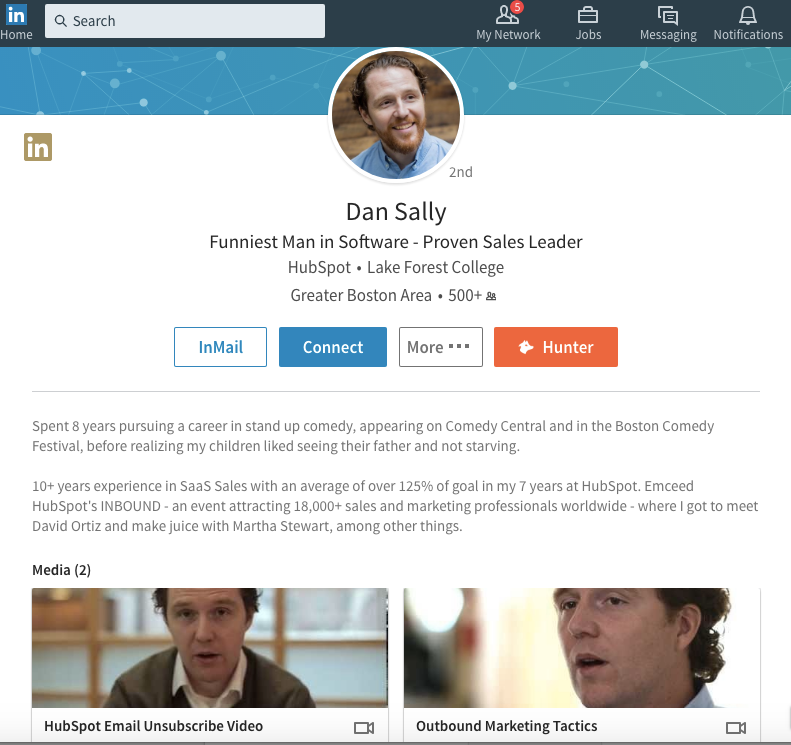 HubSpot inbound marketing specialist Dan Sally shows his personality in his summary. The detail about his previous life as a stand-up comedian is intriguing, and the line about “realizing his children didn’t like starving” is funny and relatable. Sally gets more serious in the second section, highlighting his impressive track record at HubSpot. Try it yourself: Begin your summary with an unexpected, interesting fact about yourself. In your next paragraph, tie it into your sales career. Although it might be a bit untraditional to mention your personal hobbies on your LinkedIn profile, it’s a good way to make yourself more human off the bat. 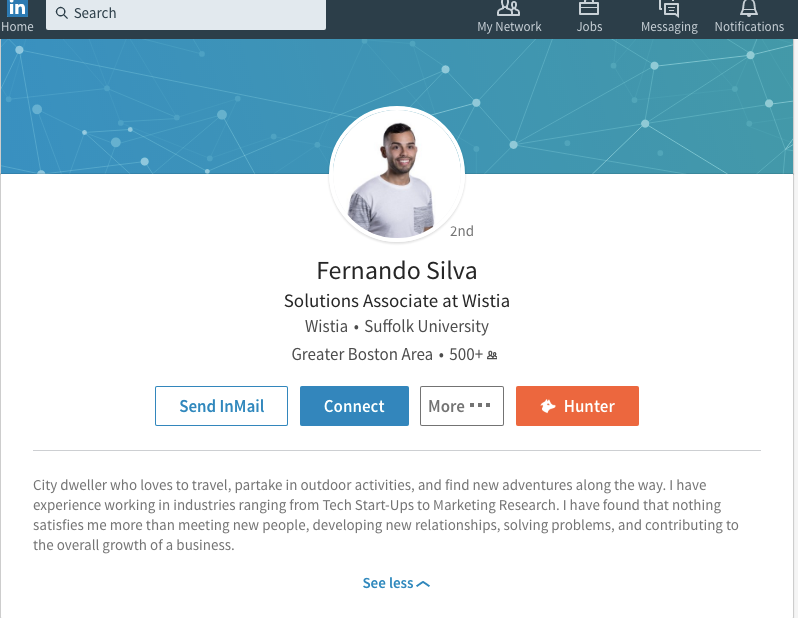 A prospect reading Wistia solutions associate Fernando Silva’s summary might think, “Oh, I also love to be outdoors.”They’ll immediately feel more connected to him. Try it yourself: List a few of the things you like to do in your free time (steering clear of anything controversial, of course). Then explain why you chose your current role and how your customers derive value. 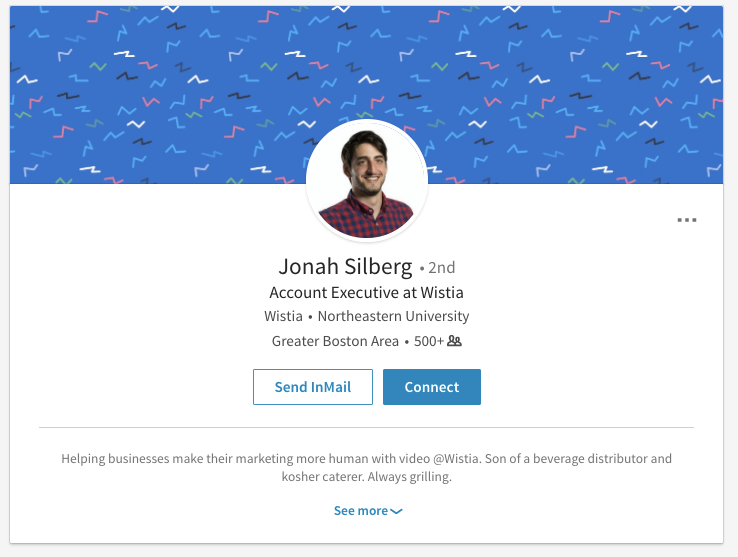 Wistia account executive Jonah Silberg opens with his mission: Enabling businesses to use video in their marketing strategy. His next two sentences help you get to know him on a personal level. The summary is short enough readers are guaranteed to finish it — but Silberg makes every line count. He makes you interested in learning more about him. 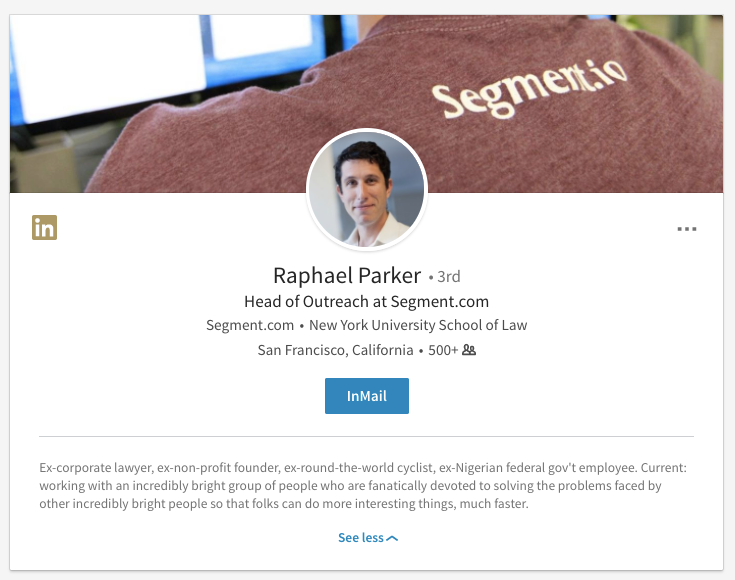 Raphael Parker, head of outreach at Segment.com, uses the same formula as Silberg — but in reverse. He begins with three of his former jobs, which immediately tells you he’s (already) had an interesting career. Parker next tells you what he’s currently up to. Try it yourself: List your former jobs. If you’ve always been in sales, get creative. Did you ever have a lemonade stand as a child? Were you a camp counselor as a teenager? What was your college gig? 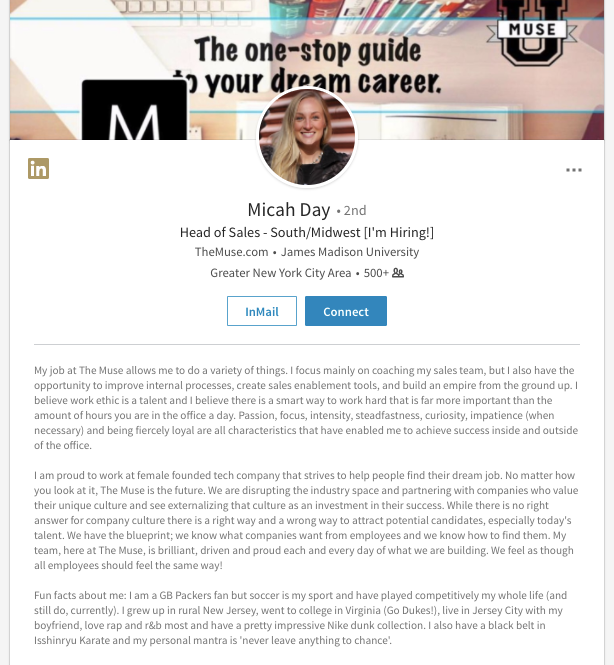 Head of The Muse’s South and Midwest sales Michah Day’s LinkedIn summary showcases her passion and enthusiasm for the role. She highlights her main responsibilities and values, tells the reader why she’s proud to work at The Muse and what sets the business apart, and lists some fun facts about herself. Try it yourself: Explain why you’re so fired up about coming into work each day. What excites you? Why do you love your company? What makes your product, culture, and/or team different from your competitors? Conclude with four or five personal tidbits about yourself. 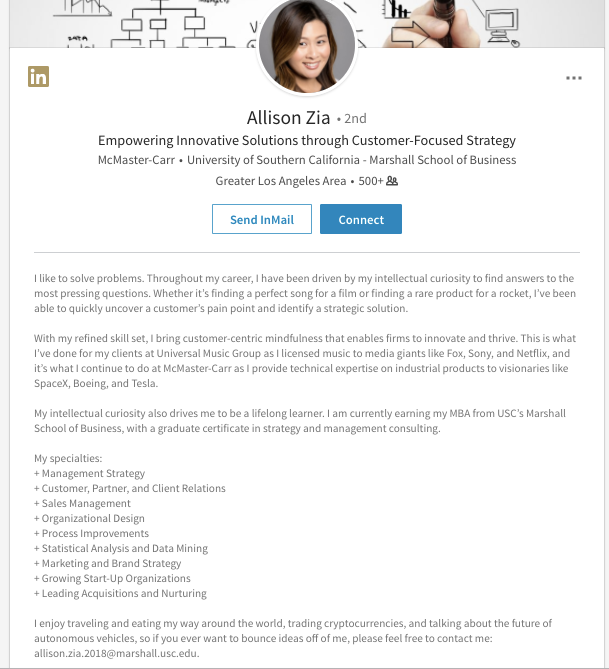 Allison Zia, a sales and operations specialist at McMaster-Carr and grad student at the University of Southern California’s Marshall School of Business, earns instant credibility with her LinkedIn summary. She starts with a bold statement: “I like to solve problems.” Zia proves it with multiple examples from her career, then spotlights her specialties. Finally, she describes a few of her interests. Try it yourself: Use a short, impactful one-liner to highlight why you’re successful or what you’re best at. Give two to four examples of how this skill or desire has manifested itself throughout your life. Discuss your areas of expertise, then wrap it up with your favorite topics of discussion. With these LinkedIn summaries to draw on, you should have plenty of ideas and inspiration for your own description. Make it personal, unique, and engaging — and prospects will feel like they know you already.